Fortunately, several patterns of disease have been identified, and these can help the clinician determine a possible cause-and-effect relationship with a particular medication or group of medications. The clinical patterns of adverse drug reactions of the oral cavity include xerostomia, swelling, nonspecific ulceration, vesiculobullous or ulcerative mucositis that mimics other disease states, nonspecific vesiculoulcerative mucositis, pigmentation, gingival enlargement, and medication-related osteonecrosis of the jaws. Agents include antidepressants and antipsychotics, antihypertensives, antihistamines, anticholinergics, and decongestants. Agents include penicillins, aspirin, sulfa drugs, and ACE inhibitors. Agents include antineoplastics (methotrexate, 5-fluorouracil, doxorubicin, and melphalan); barbiturates; dapsone; phenazone derivatives; phenolphthalein; sulfonamides; tetracyclines; NSAIDs (indomethacin, salicylates, gold salts, naproxen); meprobamate; methyldopa; penicillamine; phenylbutazone; propranolol; spironolactone; thiazides; tolbutamide; alendronate; captopril; phenytoin; MTOR inhibitors (sirolimus, temsirolimus, everolimus, ridaforolimus); and (by direct contact) compounds containing aspirin, hydrogen peroxide, or phenol. Reactions may include lichen planus–like, erythema multiforme (EM)–like, pemphigoid-like, pemphigus -like, and lupus erythematosus (LE)–like reactions. Agents include amiodarone; antimalarials (chloroquine, hydrochloroquine, hydroxychloroquine, quinacrine, quinidine); busulfan; clofazimine; cyclophosphamide; estrogen; imatinib; ketoconazole; minocycline; phenolphthalein; chlorpromazine; and zidovudine. Agents include calcium channel blockers (amlodipine, bepridil, diltiazem, felodipine, isradipine, nicardipine, nifedipine, nimodipine, nisoldipine, nitrendipine, oxidipine, verapamil); other dihydropyridines (bleomycin); cyclosporine; phenytoin; and sodium valproate. Xerostomia, or dry mouth, is the most common adverse drug-related effect in the oral cavity. To date, xerostomia has been associated with more than 500 medications. The synergistic effects of medications are well recognized and are increasingly common in elderly patients taking multiple medications (polypharmacy). In addition, habits such as smoking, alcohol consumption, and even long-term use of caffeinated drinks may contribute to oral dryness or the perception of dryness. General drug classes that are strongly associated with xerostomia include antidepressants and antipsychotics, antihypertensives, antihistamines, and anticholinergics. Unfortunately, these associations are confounded by the fact that xerostomia is a subjective complaint, and some patients who report oral dryness may have apparently normal salivary gland function. Other patients whose mouths appear to be clinically dry may have no complaints. In addition, a certain amount of acinar atrophy and decreased glandular secretions are considered a normal part of the aging process. Given these variations, clinical tests to measure salivary flow (at rest and under stimulation) should be used cautiously in assessing a patient with suspected drug-induced xerostomia. Furthermore, the possibility of an underlying autoimmune etiology (eg, Sjögren syndrome) should also be considered in xerostomic patients, especially those who also present with xerophthalmia (ie, dry eyes) or evidence of parotid swelling. Appropriate laboratory studies or biopsy of the labial minor salivary glands or parotid glands may be helpful in establishing or excluding an autoimmune etiology. Importantly, patients with xerostomia are also at increased risk for oral candidiasis, a superficial infection that may cause mucosal sensitivity or discomfort, as well as tooth decay that usually affects the cervical (gumline) and root surfaces. Cultures and oral cytologic tests can be useful in assessing possible cases of xerostomia-associated candidiasis. Meticulous oral hygiene, regular dental checkups, and the use of topical fluoride rinses are recommended to reduce the risk of dental decay. Several drugs can induce type I hypersensitivity reactions, or disease mediated by immunoglobulin E mast cells, that can range from isolated swelling of the oral tissues to full-blown anaphylaxis. Around the mouth, the lips are the most frequently involved site, followed by the tongue. Among the most common offending agents are ACE inhibitors, penicillin and penicillin derivatives, cephalosporins, barbiturates, and aspirin and other NSAIDs. Affected mucosa typically appears edematous and erythematous within minutes or hours after exposure to the offending drug. Similar contact reactions to latex had become increasingly problematic in oral health care settings until the recent shift towards non-latex replacement materials such as vinyl or nitrile rubber. ACE inhibitors are also associated with a nonallergic form of oral swelling. This reaction, which is possibly secondary to alterations in local bradykinin levels or C1 esterase inhibitor function, is reported in less than 1% of patients, with an increased risk noted among blacks in the United States. Although swelling is most commonly seen in the first weeks of therapy, it may occur within hours of the initial exposure or after an extended period of drug use. As with the type I reactions, the lips are the most typical site of involvement. The tongue and oropharyngeal tissues can also be affected, with a potentially fatal outcome. Epithelial necrosis and ulceration may result from direct application of over-the-counter medications such as aspirin, hydrogen peroxide, potassium tablets, and phenol-containing compounds to the mucosa. Aspirin is often used by patients seeking relief from dental pain. The affected mucosa appears whitish and corrugated, with erosion and ulceration of the more severely damaged areas. The associated discomfort can be severe enough to require treatment with a strong analgesic and/or a local anesthetic. Fixed drug eruptions in the oral cavity often initially appear as areas of edema and erythema that lead to localized, nonspecific ulceration. 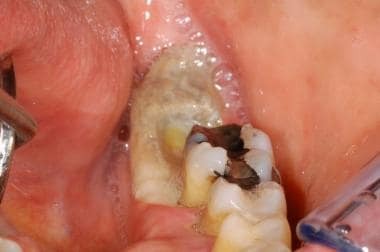 The labial mucosa is most commonly involved, and a clinical course of recurrence at the same site after drug use is diagnostically helpful, but this relationship is not always easy to establish. Extraoral involvement, including involvement of the cutaneous surface and other mucosal surfaces, may occur. Oral drug reactions that bear striking clinical, histopathologic, and even immunopathologic resemblance to idiopathic lichen planus, erythema multiforme (EM), pemphigoid, pemphigus, and lupus erythematosus (LE) are well recognized, and the list of reactions in each category is constantly expanding. Clinically, any oral site can be affected; however, the posterior buccal mucosa (cheeks), the lateral borders of the tongue, and the alveolar mucosa are most commonly involved. Lesions may be isolated, although bilateral and occasionally symmetric involvement is not uncommon. Initially described in association with antimalarial medications, lichen planus–like or lichenoid drug reactions have subsequently been reported in association with many other agents. Both papuloreticular and erosive manifestations may be observed; the latter is characterized by shallow irregular ulcerations or erosions with a peripheral border of fine keratotic striae that often appear to radiate from the center of the lesion. Although drug-induced lichenoid reactions tend to be erosive and unilateral compared with the typical bilateral presentation in idiopathic lichen planus, these associations are not consistently observed. Currently, NSAIDs and ACE inhibitors appear to be among the most frequently cited offenders (see Oral drug-reaction patterns and associated drugs and drug classes in Introduction). Interestingly, agents used in the treatment of lichen planus (eg, hydroxychloroquine, dapsone, levamisole) have themselves led to adverse lichenoid eruptions. Drug-induced EM represents approximately 25% of all reported cases. As with idiopathic or virally induced cases (the latter often due to the herpes simplex virus), the disease has a rapid onset with a variable expression that can range from lesions limited to the oral mucosa to widespread mucocutaneous involvement. Drug-induced EM is frequently linked to agents such as sulfonamides, sulfonylureas, and barbiturates, among others (see Oral drug-reaction patterns and associated drugs and drug classes in Introduction). Oral lesions start as erythematous macules or patches that lead to short-lived vesicles or bullae, followed by ragged and shallow ulcerations that may become extensive. Hemorrhagic ulceration and crusting of the labial vermilion zone is common. Any intraoral site can be involved, but the attached gingival and palatal tissues are often relatively spared. Lesional discomfort can lead to decreased fluid intake and dehydration. A variety of lesions, including classic target or bull's eye lesions, can affect the skin. More severe forms of disease include EM major (Stevens-Johnson syndrome) and toxic epidermal necrolysis (TEN, Lyell syndrome). In addition to the oral and skin lesions, conjunctivitis of the ocular mucosa and urethritis of the genital mucosa are typical findings in patients with EM major. Over three-quarters of EM major cases and virtually all cases of TEN represent adverse drug reactions. In TEN, widespread mucocutaneous epidermolysis results in diffuse bullae formation and subsequent denudation that affects significant proportions of the skin and mucosal surfaces. Severe dehydration, electrolyte imbalances, and secondary infections are potentially life-threatening sequelae, and even with aggressive therapy the mortality rate is greater than 30%. Pemphigoid-like reactions can be limited to the oral mucosa, or they can affect other mucosal or cutaneous sites. Clinically, lesions appear as relatively sturdy vesicles or bullae that break down into shallow ulcerations. Generalized or multifocal involvement of the gingival tissues may be observed, with marked erythema and erosion of the superficial gingiva, a pattern that has been called desquamative gingivitis. Thiol-containing drugs and sulfonamide derivatives are among the most commonly involved medications, as are the therapeutic classes of NSAIDs, cardiovascular agents, antimicrobials, and antirheumatics (see Oral drug reaction patterns with associated drugs and drug classes in Introduction). Circulating autoantibodies to basement membrane components may or may not be detectable. The relatively young age of the patients at onset (usually less than 70 years) may help distinguish this disease from idiopathic bullous pemphigoid or idiopathic cicatricial pemphigoid, because these latter conditions typically appear in persons aged 60-80 years. In addition, oral involvement may be more common in drug-induced bullous pemphigoid than in the idiopathic counterpart. Pemphigusike reactions can have features of either pemphigus vulgaris or pemphigus foliaceous, although pemphigus foliaceous is uncommon in the oral cavity. Thiol-containing drugs are the most common cause of pemphiguslike reactions (see Oral drug-reaction patterns and associated drugs and drug classes in Introduction). In drug-induced pemphigus vulgaris, the relatively fragile vesicles are rarely observed at clinical examination, and most cases are characterized by irregular ulcerations with ragged borders that may coalesce to involve large areas of the mucosa. Patients may have circulating autoantibodies to the desmosomal components. Drug-induced LE is a well-recognized adverse reaction that is most commonly associated with procainamide and hydralazine, although more than 70 medications are implicated (see Oral drug-reaction patterns and associated drugs and drug classes in Introduction). Clinically, the oral lesions of drug-induced LE may simulate those of erosive lichen planus, with irregular areas of erythema or ulceration bordered by radiating keratotic striae. These lesions may affect the palate, buccal mucosa, and gingival or alveolar tissues. The rarity of lichen planus on the hard palate may be helpful in differentiating it from drug-induced LE. Macular or diffuse oral pigmentation may occur after the treatment of HIV disease with zidovudine, clofazimine, and ketoconazole. Minocycline use may be associated with bluish-gray to brownish mucosal pigmentation. Staining of underlying bony structures and tooth roots and enamel can occur. Staining of the bone and tooth roots is believed to play a major role in the most notable sites of discoloration, such as the alveolar, gingival, and palatal tissues. Yet, staining of the mucosa alone has been reported in sites such as the tongue. Minocycline-associated pigmentation in a patient who had used the drug for several months to treat severe acne. Note the bluish gray hue of the alveolar mucosa superior to the attached (pink) gingival mucosa. Courtesy of Jack Caton, DDS, Rochester, NY. 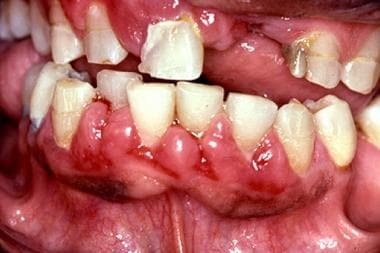 Diffuse, non-neoplastic enlargement or overgrowth of the gingival tissues was initially recognized in patients who were using phenytoin. More recently, calcium channel blockers (members of the dihydropyridine class of medications), cyclosporine, and the antiepileptic drug sodium valproate have been associated with this reaction. Within the calcium channel blocker family, nifedipine, diltiazem, verapamil, and amlodipine are among the most commonly reported causative agents (see Oral drug-reaction patterns and associated drugs and drug classes in Introduction). Gingival enlargement in a 41-year-old man with a several-year history of using calcium channel blockers. Courtesy of Carl Allen, DDS, Columbus, Ohio. Gingival enlargement is not observed in all patients. The prevalence is 25-50%, and no clear relationship has been established between the dose of the drug and the severity of the overgrowth. Synergistic effects have been reported with the use of 2 or more suspected agents. 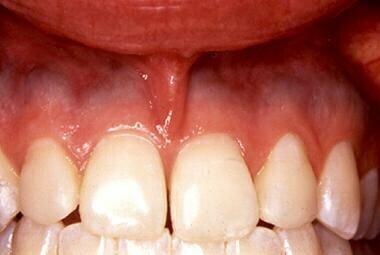 Tissue enlargement typically occurs by 1-3 months after drug therapy is initiated and begins in the superficial gum tissues between the teeth (interdental papillae). Anterior segments are more frequently involved than posterior areas, but generalized involvement is not uncommon. An inverse relationship exists between oral hygiene and the degree of gingival enlargement associated with these drugs. Although good oral hygiene typically does not prevent enlargement in susceptible individuals, it can often limit the severity of the response to acceptable levels. Although cessation or substitution of the drug may lead to regression, surgical removal of the excess tissue (ie, gingivectomy) may be necessary to permit adequate oral hygiene in certain individuals. Osteonecrosis of the jaws (ONJ) is a recognized adverse effect of bisphosphonate (BP) therapy but more recently has been described in association with other antiresorptive, antiangiogenic, and immunomodulatory medications. [17, 18, 19, 20, 21] Clinically, ONJ is characterized by prolonged exposure and necrosis of portions of the jawbone(s). BPs significantly reduce the rate of bone turnover, primarily by inhibiting osteoclastic activity. Given the relatively high metabolic demands of the jaws, it is thought that sustained use of BP drugs may suppress the ability of the jawbones to fulfill normal maintenance and repair functions, especially in the presence of the thick, complex microflora found in the oral cavity. BP drugs are widely used, most commonly in the treatment of osteoporosis and other metabolic bone diseases. The greatest risk for ONJ, however, appears to be among cancer patients. A number of malignant neoplasms, such as multiple myeloma, carcinoma of the breast, and carcinoma of the prostate, have a recognized propensity for skeletal involvement. BP therapy significantly reduces local and metastatic spread of these skeletal lesions, as well as associated morbidity and mortality. Cancer patients are treated with intravenous forms of BP and at much higher doses than those used for metabolic bone conditions. These factors may help explain why more than 90% of published cases of ONJ have occurred in the setting of cancer therapy. Exposure of the posterior left mandible in a 51-year-old woman with a history of breast cancer and treatment with intravenous bisphosphonate (zoledronic acid [Zometa]). Medication-related ONJ is characterized by exposure and devitalization of bone in the mandible or maxilla that may be asymptomatic or associated with significant pain. The mandible is involved more commonly than the maxilla (2:1); however, multifocal presentations involving both jaws or multiple sites in a single jaw are not uncommon. Prior dental surgery or extraction is reported in 60% of patients, with the remaining cases arising spontaneously. Clinically, the lesions appear as areas of exposed, yellow-white bone with margins that vary from smooth to ragged. Secondary infection of lesional sites may develop, with the development of intraoral sinus tracts or even cutaneous fistulae. Information regarding treatment and follow-up of medication-related ONJ remains limited. Conservative measures such as gentle debridement of superficial necrotic bone, topical antibiotic rinses, and systemic antibiotic therapy to control areas of active infection have shown the greatest success. While early studies found little success with aggressive surgical therapy or adjunctive measures such as hyperbaric oxygen therapy, more recent evidence suggests that they may be helpful in selected cases when combined with primary mucosal wound closure and local and systemic antibiotics. In order to prevent or reduce the risk for medication-related ONJ, all cancer patients scheduled to begin intravenous antiresorptive therapy should receive a careful dental examination to identify and eliminate active or potential sources of infection. This approach reduces the need for subsequent extractions or dentoalveolar surgery, which are known risk factors for the development of ONJ. During antiresorptive or anticancer treatment, all patients should receive periodic intraoral examinations to detect the earliest evidence of ONJ. When ONJ is identified, conservative treatment measures that minimize bone manipulation or exposure are generally favored over aggressive surgical intervention, unless the latter is warranted on the basis of pain, extensive bone exposure, presence of active infection or purulence, or combinations of these factors. For patient education resources, visitthe Allergies Center. Additionally, see the patient education article Drug Allergy. Parks ET. Lesions associated with drug reactions. Dermatol Clin. 1996 Apr. 14(2):327-37. [Medline]. Porter SR, Scully C. Adverse drug reactions in the mouth. Clin Dermatol. 2000 Sep-Oct. 18(5):525-32. [Medline]. Scully C, Bagan JV. Adverse drug reactions in the orofacial region. Crit Rev Oral Biol Med. 2004 Jul 1. 15(4):221-39. [Medline]. Wright JM. Oral manifestations of drug reactions. Dent Clin North Am. 1984 Jul. 28(3):529-43. [Medline]. Abdollahi M, Rahimi R, Radfar M. Current opinion on drug-induced oral reactions: a comprehensive review. J Contemp Dent Pract. 2008 Mar 1. 9(3):1-15. [Medline]. Yuan A, Woo SB. Adverse drug events in the oral cavity. Oral Surg Oral Med Oral Pathol Oral Radiol. 2015 Jan. 119 (1):35-47. [Medline]. McCartan BE, McCreary CE. Oral lichenoid drug eruptions. Oral Dis. 1997 Jun. 3(2):58-63. [Medline]. Scully C, Beyli M, Ferreiro MC, et al. Update on oral lichen planus: etiopathogenesis and management. Crit Rev Oral Biol Med. 1998. 9(1):86-122. [Medline]. Schlosser BJ. Lichen planus and lichenoid reactions of the oral mucosa. Dermatol Ther. 2010 May-Jun. 23(3):251-67. [Medline]. Obara K, Masuzawa M, Amoh Y. Oral lichenoid reaction showing multiple ulcers associated with anti-programmed death cell receptor-1 treatment: A report of two cases and published work review. J Dermatol. 2018 May. 45 (5):587-591. [Medline]. Vassileva S. Drug-induced pemphigoid: bullous and cicatricial. Clin Dermatol. 1998 May-Jun. 16(3):379-87. [Medline]. Civatte J. [Drug-induced pemphigus diseases]. Dermatol Monatsschr. 1989. 175(1):1-7. [Medline]. Bjekic M, Markovic M, Sipetic S. Fixed drug eruption caused by tadalafil--case report. An Bras Dermatol. 2013 Jul-Aug. 88(4):617-9. [Medline]. [Full Text]. Criado PR, Brandt HR, Moure ER, Pereira GL, Sanches Júnior JA. Adverse mucocutaneous reactions related to chemotherapeutic agents: part II. An Bras Dermatol. 2010 Oct. 85(5):591-608. [Medline]. Li CC, Malik SM, Blaeser BF, et al. Mucosal pigmentation caused by imatinib: report of three cases. Head Neck Pathol. 2012 Jun. 6(2):290-5. [Medline]. [Full Text]. Di Tullio F, Mandel VD, Scotti R, Padalino C, Pellacani G. Imatinib-induced diffuse hyperpigmentation of the oral mucosa, the skin, and the nails in a patient affected by chronic myeloid leukemia: report of a case and review of the literature. Int J Dermatol. 2018 Jul. 57 (7):784-790. [Medline]. Woo SB, Kalmar JR. Osteonecrosis of the jaws and bisphosphonates. Alpha Omegan. 2007. 100(4):194-202. [Medline]. Migliorati CA, Schubert MM, Peterson DE, Seneda LM. Bisphosphonate-associated osteonecrosis of mandibular and maxillary bone: an emerging oral complication of supportive cancer therapy. Cancer. 2005 Jul 1. 104(1):83-93. [Medline]. Ruggiero SL, Mehrotra B, Rosenberg TJ, Engroff SL. Osteonecrosis of the jaws associated with the use of bisphosphonates: a review of 63 cases. J Oral Maxillofac Surg. 2004 May. 62(5):527-34. [Medline]. Ruggiero SL, Dodson TB, Fantasia J, Goodday R, Aghaloo T, Mehrotra B, et al. Medication-related osteonecrosis of the jaw - 2014 update. 2014. Available at http://www.aaoms.org/docs/position_papers/mrong_position_paper.pdf?pdf=MRONJ-Position-Paper. Saag KG, Petersen J, Brandi ML, Karaplis AC, Lorentzon M, Thomas T, et al. Romosozumab or Alendronate for Fracture Prevention in Women with Osteoporosis. N Engl J Med. 2017 Oct 12. 377 (15):1417-1427. [Medline]. Smidt-Hansen T, Folkmar TB, Fode K, Agerbaek M, Donskov F. Combination of zoledronic Acid and targeted therapy is active but may induce osteonecrosis of the jaw in patients with metastatic renal cell carcinoma. J Oral Maxillofac Surg. 2013 Sep. 71(9):1532-40. [Medline].